A three-day visit by Patriarch Kirill of Moscow and All Russia to Istanbul is more than just his first official trip abroad as the head of the Russian Orthodox Church or than his first visit to the Patriarch of Constantinople, also known as Ecumenical Patriarch. The Moscow Patriarchate is serious about dramatically improving relations between the two most influential Orthodox Sees, switching from smoldering rivalry and at times explosive conflict to closer cooperation. Taking into consideration that the Greek American community constitutes the main political and financial base for the Patriarchate of Constantinople, and the official Washington has always patronized this once glorious See in the capital of the Byzantine Empire, which faces many perils in modern Turkey, one could be forgiven for drawing a distant parallel with expectations of a “reset” in the Russian-American relations. The last serious conflict in relations between Moscow and Constantinople occurred about a year ago around the time of the 1020th anniversary of the Baptism of Rus. 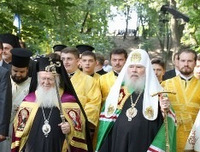 Ukrainian President Viktor Yushchenko tried to involve Patriarch Bartholomew of Constantinople in resolving the issue of the Orthodox schism in Ukraine in a way that could marginalize the Moscow Patriarchate and violate the rights of the canonical Ukrainian Orthodox Church under its jurisdiction. Only intense talks shortly before the celebration made it possible to avoid a disastrous development and the meeting between Patriarch Bartholomew and the late Patriarch Alexy II in Kiev was the beginning of normalizing relations. Last October Patriarch Alexy took part in a meeting of the heads of Orthodox Churches in Istanbul, but within two months Patriarch Bartholomew was to preside over the funeral service for the Patriarch of Moscow. “We need to avoid confrontation and conflict and to create a system of mutual trust, because local Orthodox Churches constitute a single family,” said Archbishop Hilarion of Volokolamsk, Chairman of the Moscow Patriarchate’s Department of External Church Relations. These “confrontation and conflict” have emerged in recent years mainly outside of Russia. The Patriarchate of Constantinople, guided by its interpretation of Byzantine-era canons, claims the right of jurisdiction over the entire Orthodox “diaspora,” or Orthodox Christians living outside the historic boundaries of ancient patriarchates. This position does not recognize which of the local Churches introduced Orthodoxy to a particular country or in what languages Orthodox believers worship in Americas, Western Europe or Australia. The most acute crisis in relations between the two Patriarchates occurred in 1995, when Constantinople resumed its jurisdiction in Estonia, causing a short-term break of communion between the two Sees. The Moscow Patriarchate maintains that the Mother Church for Orthodox believers beyond the canonical borders of mutually recognized Churches should be the Church that had originally introduced Orthodox faith to the territory or the one chosen by a particular Orthodox community. As a result of this unresolved issue in many large Western cities, such as Paris or New York, there are several Orthodox bishops belonging to various jurisdictions, a situation in direct violation of the Orthodox canons which declare that there should be one ruling bishop in a city. A month ago a pan-Orthodox conference in Chambesy, Switzerland managed to reach a compromise to establish standing conferences of Orthodox bishops in the countries of the “diaspora.” They will be chaired by bishops of the Ecumenical Patriarchate, but decisions at these conferences may be reached by consensus only. All bishops would remain subordinate to their respective Patriarchates, while the local Churches have the right to independently engage in contacts with foreign governments, international and public organizations. That is, Chambesy documents stipulated the agreement that consultations are necessary, reaffirmed the primacy of the Patriarchate of Constantinople, but stressed that there will be no administrative subordination to it. The fact that Constantinople made such concessions to Moscow means that Phanar - the historical district of Istanbul housing the church headquarters - is ready for a new phase in relations between the Churches. Another contentious issue is the right to recognize the canonical independence of a particular local Church. For example, Constantinople does not recognize the independent status of the Orthodox Church in America granted by Moscow in 1970. And Moscow does not recognize the jurisdiction of Constantinople in Estonia. This unresolved matter has a direct bearing on the most painful issue for Moscow - the status of the Ukrainian Orthodox Church. 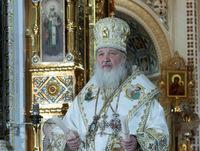 “I know that Patriarch Kirill has a sincere desire to create a new relationship between our two Churches, to create an atmosphere of trust and build a civilized dialogue on all issues including those where our positions still diverge,” said Archpriest Nikolai Balashov, Deputy Chairman of the Department of External Church Relations of the Moscow Patriarchate. The forthcoming visit will show whether this goal can be achieved. Some Russian Church diplomats express optimism in private conversations, saying the contradictions between Moscow and Constantinople are of a “mythical” nature, whereas the modern world demands a “strategic alliance” between the two most influential patriarchates. Others are more skeptical, recalling the numerous intrigues and betrayals over the past decades. It seems that considering good Russian-Turkish relations of recent times, Moscow may have something to offer to the Patriarchate of Constantinople in light of its rather humiliating status in modern Turkey. One way or another, this visit will be significant for millions of Orthodox believers worldwide.